Experience the latest in assisted-opening technology with the SOG FSAT-98 Flash II Tanto Serrated folding knife. SOG's patented Assisted Technology® delivers split-second blade deployment, ensuring the knife is ready to use in a moment's notice. Once deployed, the blade locks into place preventing accidental injuries from unintended closure. 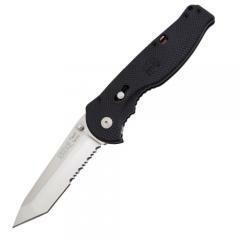 The AUS-8 steel blade is partially serrated with a Tanto-style tip to deliver the versatile cutting power needed to handle any situation. Built for rugged durability, the Flash II features a textured, glass-reinforced handle with machined finger grooves for a balanced grip and superior handling.